Want a TV cabinet that looks as impressive as what’s on screen? 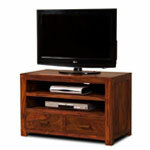 Our range of beautifully designed and skillfully manufactured wooden TV cabinets are made to suit your living space. And if you’re looking for a corner TV cabinet, we’ve got those, too.